A little number of insects is more bothersome and unpleasant than mosquitoes are. They may make a great food for birds and bats, but you definitely don’t want them hanging around your backyard and your apartments. You also don’t want to “bathe” yourself with harsh chemicals to effectively repel them, correct? So, apart from getting rid of any standing stale water (including those rain gutters! ), what else can you do to keep pesky mosquitos at safe distance? It turns out that mosquitoes, along with many other stinging insects, are attracted to specific odors that come from human skin. They are especially attracted to your body odor and other secretions, meaning that if you are spending a lot of time on the move and sweating, you can expect to have an army of busy mosquitos chasing you around. Luckily, certain strong—or unpleasant to the bugs—smells can both hide your scent and “talk them out” from landing on your skin and biting you! The 8 plants described below have exactly the strong scent that most humans find pleasant, but mosquitos don’t. They can help you to mask your own smell and keep nearby mosquitoes away from you. 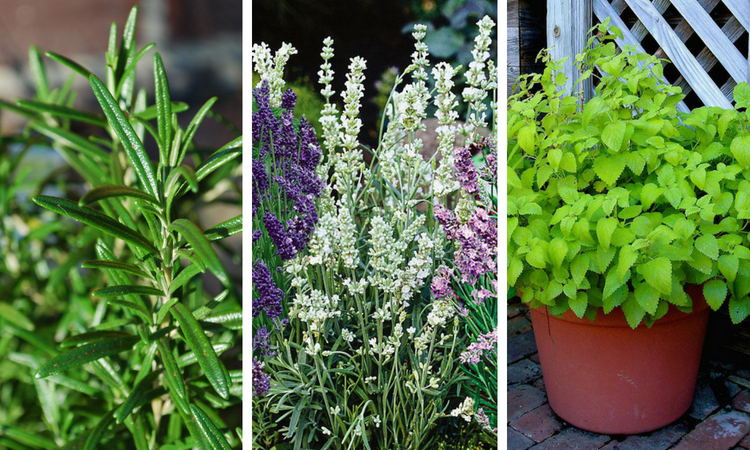 These 8 herbs work great in consort and can be kept in pots on a porch, near a door, or anywhere else you plan to gather together out-of-doors. This fragrant mint “cousin” contains a chemical called nepetalactone, which is both a feline attractant and a useful insect repellent. While Catnip does repel mosquitoes in close proximity, some people apply crushed leaves for more protection. Note: Your catnip might bring all the cats to the yard. The perennial herb, related to mint, is easy to grow. This member of the mint family has white flowers and a gentle lemony scent, as well as some healing properties. It is particularly good at keeping biting insects away, but it is also an invasive species, so be careful when growing it. A 2009 study showed that the essential oil from this delicious herb is toxic to mosquito larvae. This beautiful potent plant with one of the freshest odors, not only repels mosquitoes, but also keeps moths and flies away. The flower’s perfume is well-known, and while it will scent the air, it is still most effective when actually rubbed onto the skin. This plant in its concentrated form is sometimes used as an insect repellent, and its essential oil has been shown to keep away the adult species of several insects as well as their larvae. This perennial is actually marketed as “mosquito plant,” primarily due to its strong citronella-like smell. Unfortunately, though it is most busily advertised, there is some research that suggests it is also the least effective at keeping away mosquitoes! Still, there are some benefits to be gained from rubbing it on your skin, and if there is nothing else around, it will provide certain protection. Rosemary is an herb that many of us are very familiar with and their woody scent is exactly what keeps mosquitoes as well as cabbage moths and carrot flies away. They do best in hot and dry climates and thrive in containers, which may be ideal for areas with winters. They can also be pruned into all sorts of shapes and sizes and make great borders or decorations. While the pests stay away you can enjoy the herb’s scent and also use it to season your cooking. The incense of both sage and rosemary when they burn not only smells good, but it is also unpleasant enough for the little critters and will keep them away—provided you are near the smoke! So, you can’t just plant and be done, however. The aroma needs to be in the air around you, at the very least, and ideally on your skin. To get the maximum effect, crush herb leaves in your hands to release their perfume, and then gently rub the leaves and their oils over your skin. On the other hand, when you are away from your garden – hopefully full of natural mosquito repellents – you may still need an organic bug repellent.